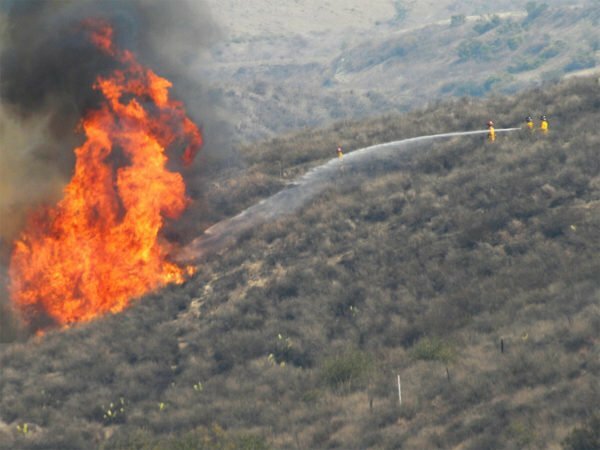 Southern California authorities have order the evacuation of 82,000 people from San Bernardino County after a wildfire broke in a mountain pass. The blaze broke out on August 16 and has already engulfed about 15,000 acres of land. Tens of thousands of homes are at risk from the so-called Blue Cut fire. A state of emergency has been declared. Another fire, the Clayton, which broke out on August 13 in northern California, has destroyed 175 homes. The Bluecut fire spread with great speed in the parched canyons around San Bernardino. At least a dozen buildings have already been engulfed. California Governor Jerry Brown has declared a state of emergency in San Bernardino County to bring in federal assistance. The wildfire forced the closure of a stretch of Interstate 15, the main road between Las Vegas and Los Angeles area. Some 700 firefighters are battling to control the blaze in the Cajon Pass. Its cause remains unknown. The fire is now heading into the Mojave Desert. The main communities forced to evacuate were the ski resort of Wrightwood and the desert town of Phelan. Further north, the Clayton Fire in Lake County was now 35% contained, California’s department of forestry and fire protection said. The authorities announced on August 16 that Damin Pashilk, 40, was facing 17 counts of arson and was suspected of involvement in numerous other fires in the Lake County area over the past year. He will appear in court on August 17. A third fire, the Chimney, has affected 6,900 acres since August 13 and has destroyed about 40 buildings in central California.